This document was brought out after our conference Worlds of Fear: School Cultures. It contains the proceedings of the four day event held in December 2015. This document captures some of the flavour of the work done by members of the school community during the mela terms at CFL in 2015. 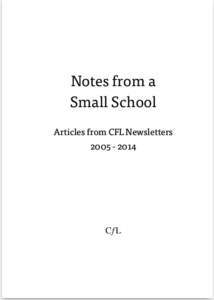 This is a small collection of lead articles from CFL newsletters over the past ten years (2005-2014), brought out on the occasion of our 25th year.